I'm hitting some financially scary times and need to start stocking up cash and proving (to myself and creditors) that Battle Gem Ponies is definitely a game lots of people are willing to pay for. Here are some notes I'm pondering over. I'd love to hear your two-cents on this Patreon boost plan because something compelled some of you guys to go all-in and support Battle Gem Ponies, and others to read my blogs weekly for years and still think "Nah. Thanx fam." I'd like to see how to make this a more enticing and satisfying experience for everyone. I need to clearly explain the concept that on THIS particular patreon page, it's possible to get into higher tiers by continuing to pay into your current one until you reach a threshold. For example, if you stick around on the $10 tier list for 3 months, you get the rewards of the $25 tier now too! Patreon tracks all that info for me, so it'd be easy to know who qualifies for what rewards. Something like "Stacked Pledges", or "Pledge Pileups" any ideas? "Be the first to put it on YouTube!" Access Behind the Scenes secrets I don’t even post about on the public development blog. Game files like select WIP source code scripts, sprite sheets, and audio files. I’ll sneak in an easter egg of your choice. Want somebody to say a certain meme? Only for you. Your Name cameos in opening splash screen alongside copyright info. “This game was made possible by donations by generous Patrons like ?? ?” name randomly plucked from list of high tier Patrons. Quarterly Transparency Posts detailing exactly where the money goes. No ultra, just a quick big sprite and the mini version with a front, back, and side view. Really Emphasize the high donor shoutouts. I link to your stuff on my blogs & videos? Access to the WIP “Strategy Guide” I’m using to pace out the story. The game design document basically [SPOILERS galore]. YouTube DevLogs like other popular projects. Emphasize getting awesome rewards for donating. The game is coming no matter what, but it’ll come a lot sooner if I don’t have to spend most of the day programming for somebody else. If you can’t donate but want to help, spread the word! 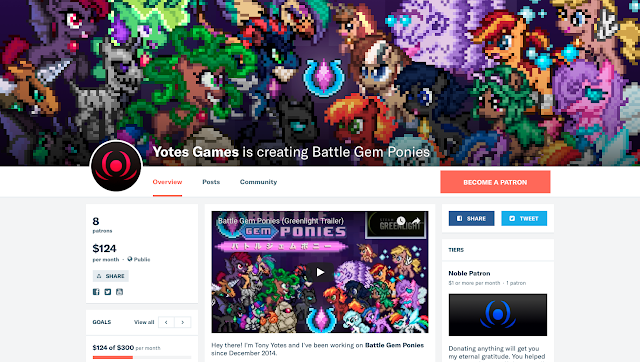 Sharing Battle Gem Ponies with your friends is priceless and the true goal at the end of this. I want as many people loving this project as possible even if most can’t spend a dime. I’m even designing the free version of the game to be it’s own satisfying experience because I already know most people usually just checkout a free demo and maybe a Let’s Play before becoming a fan and deciding if they want to buy the game themselves down the road. Ask for Patron feedback on tiers and goals. Improve Patreon description with bold headers over paragraphs. The text should be easy on the eyes, concise, and persuasive. Update links in "Follow Us" section. On Patreon, Weekly DevBlog posts just be links, then “Development Update June 4th, 2018” followed by a quick summary sentence. On Fridays a Patron exclusive real-talk progress report goes up. mention any lofty goals in mind. Transparency posts at the end of each fiscal quarter. Show honesty and be educational about the costs of getting into development & game marketing. Always use big bold headers in patreon text to guide the eye. Others use this trick to great effect. New monthly updated builds for Patrons with more polish & features. In addition to the highly polished public demos anyone can play. Share Art celebrating milestones. Look for any reason to shout "Hooray!" Use clearer language to emphasize needing to get to the next milestone and we're soooo close to kickin' this up a notch. no more “pay musicians early”, they told me they're fine waiting. cover basic living expenses so I can work on BGP without picking up a side job or making BGP into a side job. I can get by with $400 a month in my particular situation. I hear $30-$50 per video is a fair price for freelance editors considering the type of content I'm putting out there. Any more than $5,000 a month in donations is just plain bonkers! I’d probably stack the excess on top of expo tour expenses and go demo the game in even more places. Or maybe stash the extra cash away for localization post-launch. Get this game playable in every language! But I probably wont be able to afford the full translation bill until after launch, assuming the game becomes popular enough. Estimates point to professional localization apparently costing $12K per language for such a text-heavy game, and there's 7 main ones I want BGP to have. So what do you guys think of this Patreon revamp? I'm thinking about raising a big hoopla about it once the big demo is out and trying to entice folks to join the Patreon while I polish the game up for an open public release I'll be pushing onto mainstream YouTubers & games press. In short, I think I need to start making more entertaining and frequent YouTube videos and also more enticing Patreon rewards if I want BGP to get the attention and support it needs to be a success. What things do YOU think would help Battle Gem Ponies get more popular? I'm up for any and all suggestions!